Electricity substation is a part of an electrical generation, transmission, and distribution system. Electricity substation transform voltage from high to low, or the reverse, or perform any of several other important operations. Between the generating power station and domestic consumer, electric power may flow through several substations at different voltage levels. Electricity substation may be owned and operated by an electrical utility, or may be owned by a large industrial or commercial customer. Generally substations are unattended, relying on SCADA for remote supervision and control. A substation may include transformers to change voltage levels between high transmission voltages and lower distribution voltages, or at the interconnection of two different transmission voltages. The word substation comes from the days before the distribution system became a grid. As central generation stations became larger, smaller generating plants were converted to distribution stations, receiving their energy supply from a larger plant instead of using their own generators. The first substations were connected to only one power station, where the generators were housed, and were subsidiaries of that power station. 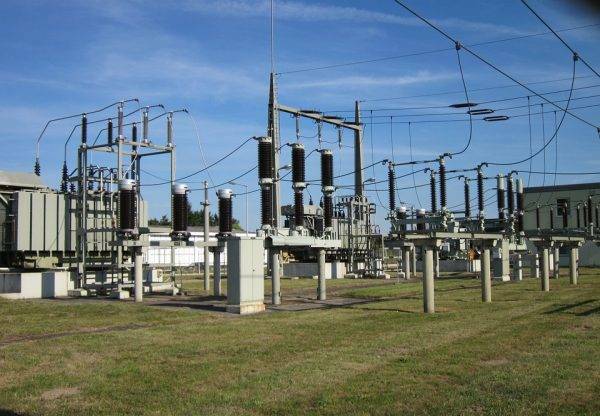 Substations generally have switching, protection and control equipment, and transformers. In a large substation, circuit breakers are used to interrupt any short circuits or overload currents that may occur on the network. Smaller distribution stations may use recloser circuit breakers or fuses for protection of distribution circuits. Substations themselves do not usually have generators, although a power plant may have a substation nearby. Other devices such as capacitors and voltage regulators may also be located at a substation. Substations may be on the surface in fenced enclosures, underground, or located in special-purpose buildings. High-rise buildings may have several indoor substations. Indoor substations are usually found in urban areas to reduce the noise from the transformers, for reasons of appearance, or to protect switchgear from extreme climate or pollution conditions. Where a substation has a metallic fence, it must be properly grounded to protect people from high voltages that may occur during a fault in the network. Earth faults at a substation can cause a ground potential rise. Currents flowing in the Earth’s surface during a fault can cause metal objects to have a significantly different voltage than the ground under a person’s feet; this touch potential presents a hazard of electrocution. Substations may be described by their voltage class, their applications within the power system, the method used to insulate most connections, and by the style and materials of the structures used. These categories are not disjointed; to solve a particular problem, a transmission substation may include significant distribution functions, for example. A distribution substation in Scarborough, Ontario disguised as a house, complete with a driveway, front walk and a mown lawn and shrubs in the front yard. A warning notice can be clearly seen on the “front door”. Disguises for substations are common in many cities. A distribution substation transfers power from the transmission system to the distribution system of an area. It is uneconomical to directly connect electricity consumers to the main transmission network, unless they use large amounts of power, so the distribution station reduces voltage to a level suitable for local distribution. The input for a distribution substation is typically at least two transmission or subtransmission lines. Input voltage may be, for example, 115 kV, or whatever is common in the area. The output is a number of feeders. Distribution voltages are typically medium voltage, between 2.4 kV and 33 kV depending on the size of the area served and the practices of the local utility. The feeders run along streets overhead (or underground, in some cases) and power the distribution transformers at or near the customer premises. In addition to transforming voltage, distribution substations also isolate faults in either the transmission or distribution systems. Distribution substations are typically the points of voltage regulation, although on long distribution circuits (of several miles/kilometers), voltage regulation equipment may also be installed along the line. The downtown areas of large cities feature complicated distribution substations, with high-voltage switching, and switching and backup systems on the low-voltage side. More typical distribution substations have a switch, one transformer, and minimal facilities on the low-voltage side. A transmission substation connects two or more transmission lines. The simplest case is where all transmission lines have the same voltage. In such cases, substation contains high-voltage switches that allow lines to be connected or isolated for fault clearance or maintenance. A transmission station may have transformers to convert between two transmission voltages, voltage control/power factor correction devices such as capacitors, reactors or static VAR compensators and equipment such as phase shifting transformers to control power flow between two adjacent power systems. Transmission substations can range from simple to complex. A small “switching station” may be little more than a bus plus some circuit breakers. The largest transmission substations can cover a large area (several acres/hectares) with multiple voltage levels, many circuit breakers and a large amount of protection and control equipment (voltage and current transformers, relays and SCADA systems). Modern substations may be implemented using international standards such as IEC Standard 61850. Substations may be associated with HVDC converter plants, traction current, or interconnected non-synchronous networks. These stations contain power electronic devices to change the frequency of current, or else convert from alternating to direct current or the reverse. Formerly rotary converters changed frequency to interconnect two systems; such substations today are rare. In distributed generation projects such as a wind farm, a collector substation may be required. It resembles a distribution substation although power flow is in the opposite direction, from many wind turbines up into the transmission grid. Usually for economy of construction the collector system operates around 35 kV, and the collector substation steps up voltage to a transmission voltage for the grid. The collector substation can also provide power factor correction if it is needed, metering and control of the wind farm. In some special cases a collector substation can also contain an HVDC converter station. Collector substations also exist where multiple thermal or hydroelectric power plants of comparable output power are in proximity. Examples for such substations are Brauweiler in Germany and Hradec in the Czech Republic, where power is collected from nearby lignite-fired power plants. If no transformers are required for increase of voltage to transmission level, the substation is a switching station.